Formerly regarded as a rare disease, bronchiectasis is now increasingly recognised and a renewed interest in the condition is stimulating drug development and clinical research. Bronchiectasis represents the final common pathway of a number of infectious, genetic, autoimmune, developmental and allergic disorders and is highly heterogeneous in its aetiology, impact and prognosis. The goals of therapy should be: to improve airway mucus clearance through physiotherapy with or without adjunctive therapies; to suppress, eradicate and prevent airway bacterial colonisation; to reduce airway inflammation; and to improve physical functioning and quality of life. Fortunately, an increasing body of evidence supports interventions in bronchiectasis. The field has benefited greatly from the introduction of evidence-based guidelines in some European countries and randomised controlled trials have now demonstrated the benefit of long-term macrolide therapy, with accumulating evidence for inhaled therapies, physiotherapy and pulmonary rehabilitation. 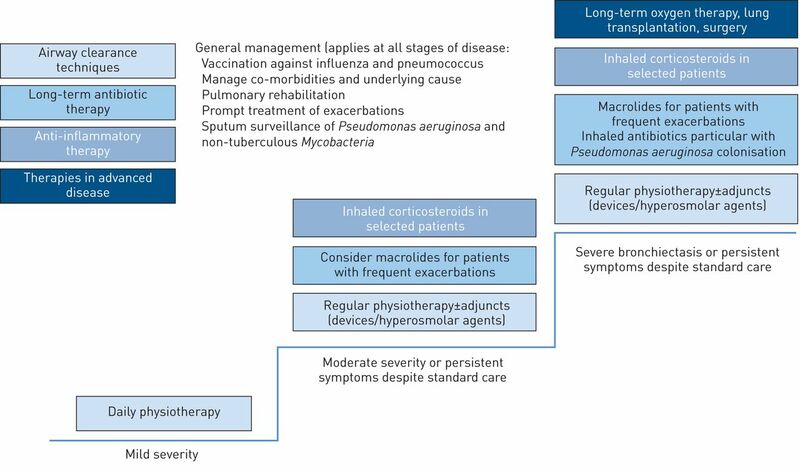 This review provides a critical update on the management of bronchiectasis focussing on emerging evidence and recent randomised controlled trials. Bronchiectasis not due to cystic fibrosis (“non-CF bronchiectasis”, henceforth referred to simply as bronchiectasis) is characterised radiologically by permanent dilation of the bronchi, and clinically by a syndrome of cough, sputum production and recurrent respiratory infections . Having been previous regarded as a neglected “orphan” disease, recent years have seen renewed interest in the disease, resulting in more clinical research and the development of new treatments . The purpose of this article is to provide a state-of-the-art review on the rapidly developing field of bronchiectasis, focussing on existing and developing therapies. The authors conducted a systematic review of the PubMed database up to November 2014 using the search term “bronchiectasis” with “treatment”, “antibiotics”, “physiotherapy”, “macrolide”, “anti-inflammatory”, “inhaled”, “bronchodilators” and “mucolytics”. The search was supplemented by reviewing treatment options identified in the British Thoracic Society (BTS) bronchiectasis guidelines  and Spanish SEPAR bronchiectasis guidelines  and conducting updated searches for additional studies. New treatment strategies were identified through searches of clinical trials registries. The prevalence of bronchiectasis is not precisely known and has been historically underestimated. International data show an increase in the prevalence of bronchiectasis over recent years. In Europe, Ringshausen et al. reported an increase in hospitalisations for bronchiectasis in Germany between 2005 and 2011 with an average increase in the age-adjusted rate of 2.9% per year . Similar data have been reported from the USA . The overall prevalence is not precisely known and recent estimates of 52/100 000 from the USA are likely to be an underestimate . The impact on healthcare systems is substantial. A recent multicentre European study of 1310 patients with bronchiectasis identified an annual exacerbation frequency of 1.8–3 per patient per year, with a hospitalisation rate of 26.6–31.4% over 2 years follow-up . Bronchiectasis has a clear attributable mortality. In the largest cohort study reported to date, 50% of patients died from respiratory causes, with around one-quarter dying from cardiovascular diseases . Loebinger et al. provided long-term data on mortality by following up a cohort of patients first recruited for the validation of the St. Georges Respiratory Questionnaire (SGRQ) in 1994. These patients were followed up for 14 years. 30% of the cohort died over this period, representing a greater than two-fold increase over the expected mortality for the healthy population. 70% of deaths were due to respiratory causes. In a prospective cohort analysis of 245 patients in secondary care in Belgium, Goeminne et al. found that 58% of deaths were respiratory related and 16% were cardiovascular. Therefore, it is clear, at least in secondary care bronchiectasis cohorts, that patients experience a high rate of exacerbations, hospital admissions and attributable mortality, emphasising the need for high-quality specialised care for these patients. Our understanding of the pathophysiology of bronchiectasis is limited, in part because of the lack of representative experimental models. Airway inflammation in bronchiectasis is dominated by neutrophils, driven by high concentrations of neutrophil chemo-attractants such as interleukin-8 (CXCL-8) and leukotriene B4 [11–14]. Airway bacterial colonisation occurs because of impaired mucociliary clearance and because of failure of neutrophil opsonophagocytic killing. Since neutrophils from bronchiectasis patients are believed to be normal prior to their arrival in the airway, it is likely that the airway inflammatory milieu itself impairs bacterial clearance [15, 16]. Work over several decades has implicate neutrophil elastase in this process. The effects of elastase on airway epithelial cells includes slowing of ciliary beat frequency and promotion of mucus hypersecretion [17, 18] while impairment of opsonophagocytosis occurs at multiple levels, through cleavage of opsonins from the bacterial surface and cleavage of the neutrophil surface receptors FcγRIIIb and CD35 [19, 20]. Alpha defensins released from neutrophil granules also suppress phagocytic responses . Other mechanisms of immune dysfunction include failure of clearance of apoptotic cells and T cell infiltration, with recent evidence pointing to an important role of Th17 cells [22, 23]. Nevertheless, much more work is needed to unravel the complexities of the host response in bronchiectasis. Significant recent advances in our understanding of bronchiectasis have arisen through 16S rRNA sequencing technologies which allow a comprehensive analysis of polymicrobial bacterial communities in the lung . Such technologies have clearly disproven the previous teaching that the healthy airway is sterile. Studies in bronchiectasis reveal colonisation with familiar pathogens such as Haemophilus sp., Pseudomonas aeruginosa and Moraxella sp., but also organisms previously not recognised by culture-based studies like Veilonella sp., Prevotella sp. and Neisseria sp. [25, 26]. Clinical translation to date suggests that loss of diversity, with dominance of one or a few species, is associated with worse lung function and more exacerbations, and that loss of diversity may occur during exacerbations [25–28]. Overall these studies are consistent with data from culture based studies, with Pseudomonas aeruginosa dominance being associated with worse lung function and more exacerbations whether by molecular- or culture-based means and high bacterial loads of “classical” bronchiectasis pathogens being associated with higher neutrophilic inflammation and more exacerbations . Bacteria have their own methods of evading airway clearance. An important recent study identified that P. aeruginosa can induce the formation of O-antigen specific immunoglobulin (Ig) G2 antibodies which then protect the bacteria from complement-mediated killing . A significant proportion of patients with severe bronchiectasis and P. aeruginosa colonisation had these antibodies and they correlated with worse lung function and disease severity. Successful stabilisation of a patient with plasma exchange demonstrated the potential of this finding to change clinical practice . Since such responses are not necessarily unique to P. aeruginosa, this finding could have even broader implications, and requires further study. Additional defects in the complement system, particularly mannose-binding lectin deficiency have now been associated with more severe bronchiectasis in CF , common variable immunodeficiency , primary ciliary dyskinesia  and in a general population of patients with bronchiectasis . Despite these advances, the pathophysiology of bronchiectasis is still best understood in terms of the vicious cycle hypothesis first proposed by Cole . Since progression of the disease is linked to failed mucus clearance, airway bacterial colonisation, airway inflammation and airway structural damage, the goals of therapy should be to halt or reverse these processes and thereby “break the cycle”. Figure 1 shows a modification of the original vicious cycle indicating the treatment options for each component . The following sections discuss these therapeutic approaches in detail . Current therapies for bronchiectasis displayed according to Cole's vicious cycle hypothesis. Pathological processes are shown in boxes with the current recommended therapies next to them. 7–18% of patients with bronchiectasis are current smokers, based on large cohort studies to date . As with other respiratory diseases, patients with bronchiectasis should be encouraged to stop smoking. Vaccination against influenza and pneumococcal disease is also recommended as for other chronic respiratory disorders although there are no specific data in bronchiectasis about its impact . Bronchiectasis represents the final common pathway of a number of diseases, many of which require specific treatment. Despite extensive testing, however, in secondary care populations studied to date 35% , 43%  and 53%  of patients may have no identifiable cause. Post-infectious bronchiectasis is often used as a diagnostic label for patients with a history of severe or childhood respiratory infections, affecting 20–30% of patients [7, 34–37]. There is little evidence so far that they represent a distinct phenotype from idiopathic bronchiectasis and some cases may represent recall bias . Less data on aetiology is available outside the UK, but data from Italy and Belgium suggested a spectrum similar to the UK with perhaps fewer patients with allergic bronchopulmonary aspergillosis (ABPA) and more with chronic obstructive pulmonary disease (COPD) . Data from the USA clearly demonstrate more bronchiectasis due to non-tuberculous Mycobacteria (NTM) in some centres , and a report by McShane et al. of 106 patients identified an aetiology in 93% of cases. The BTS guidelines recommend testing for underlying causes including measurement of immunoglobulins (IgA, IgM, IgG and IgE), testing to exclude ABPA (specific IgE to Aspergillus, IgG to Aspergillus and eosinophil count) and specific antibody responses to pneumococcal and Haemophilus vaccination . Sputum culture to exclude NTM, and measurement of autoantibodies are also suggested. Testing for CF (sweat test and/or screening for common CF mutations) is recommended for patients aged <40 years or with recurrent P. aeruginosa and Staphylococcus aureus isolation, or upper lobe predominant disease irrespective of age . Additional testing is recommended in specific circumstances (bronchoscopy, α1 antitrypsin, ciliary function tests). COPD appears to be a very common aetiology, with bronchiectasis reported in up to 50% of patients with moderate-to-severe COPD [40, 41]. Bronchiectasis also appears relatively common in patients meeting the diagnostic criteria for asthma . Focal bronchiectasis may be associated with bronchial obstruction. Gastro-oesophageal reflux frequently co-exists with bronchiectasis and has been suggested as an aetiological factor in some cases . Immunoglobulin replacement, steroids and anti-fungals for ABPA, treatment for NTM and of CF all represent opportunities to specifically treat the underlying cause and so systematic testing of all patients is recommended in consensus guidelines [2, 3]. Most physicians recommend mucus clearance as the mainstay of therapy in bronchiectasis. Consensus guidelines recommend that all patients with bronchiectasis receive some instruction in physiotherapy, even if for very mild patients, they only perform physiotherapy during exacerbations. There are a wide range of techniques and, in the author's opinion, the chosen technique should be tailored to the patient preference, taking into account that simple and quicker techniques will encourage patient adherence [44, 45]. The evidence for physiotherapy interventions in bronchiectasis is weak. Murray et al. performed a randomised crossover trial in 20 patients not currently practicing chest clearance, and compared use of the Acapella® (Smiths Medical, London, UK) oscillatory positive expiratory pressure device for 3 months with no chest physiotherapy for 3 months. At completion of the study, cough improved as measure by the Leicester Cough Questionnaire (LCQ), with increases in spontaneous 24-h sputum volume and exercise capacity. The effect on quality of life (7.8 points on the SGRQ) was excellent and well above the clinically important difference of 4 points . The poor state of evidence in this area, however, is illustrated by the associated Cochrane review ). This review found the body of evidence for physiotherapy in bronchiectasis constituted five trials with 51 participants . They concluded that airway clearance techniques were safe and that the limited data suggested improvements in sputum expectoration, reduced hyperinflation and improved health-related quality of life in stable patients. One of the most effective forms of chest physiotherapy, in the authors’ opinion, is exercise . Pulmonary rehabilitation is recommended for patients with bronchiectasis and although studies to date have been small, they have clearly demonstrated the benefits of rehabilitation are at least as great in bronchiectasis as in COPD . In a retrospective study, Ong et al. studied 95 patients with bronchiectasis, demonstrating a mean improvement in 6-min walk distance of 53 m which was sustained to 12 months (difference at 12 months 20.5 m) . A subsequent pilot randomised controlled trial showed improvements in LCQ and SGRQ sustained to 20 weeks after treatment . In a recent randomised controlled trial by Lee et al. , an 8-week supervised exercise training schedule that include airway-clearance techniques was compared with standard care . 43 patients were randomised to exercise training and 43 to standard care. At the end of treatment, patients in the exercise group had an increase in 62 m in their incremental shuttle walk distance, improved dyspnoea and a reduced time to the next exacerbation and total number of exacerbations over 12 months (median (IQR) 1 (1–3) versus 2 (1–3); p=0.01). This study clearly demonstrates a benefit of exercise to patients with bronchiectasis, but most of the benefits were not sustained to 6 or 12 months suggesting this kind of intervention needs to be continuous to achieve long-term benefits . A variety of agents, such as nebulised hypertonic saline solution, mannitol and mucolytic agents, have been developed to help patients to clear airway secretions. Hypertonic saline may improve forced expiratory volume in 1 s (FEV1) when used in combination with chest physiotherapy but a recent trial could not clearly establish it was superior to 0.9% saline [51, 52]. A large trial of hypertonic saline is needed. Recombinant DNase is effective in CF but has been shown to be potentially harmful in a randomised controlled trial by O'Donnell et al. in bronchiectasis, reducing FEV1 . It is therefore not advised for use in this group of patients, and highlights the different pathophysiology in bronchiectasis, compared with CF-associated bronchiectasis. The mucolytics, for example carbocisteine and N-acetylcysteine, are widely used as evidenced by the BTS audit, but there are no controlled trials to demonstrate if this practice is beneficial . Inhaled dry powder mannitol has been the subject of two recent phase 3 randomised controlled trials  The first study included 231 patients on 320 mg mannitol twice daily or placebo (an inactive dose of mannitol) twice daily for 12 weeks followed by open label extension for 52 weeks. The study found an increased sputum weight in favour of mannitol (mean 4.3 g) with no significant difference in quality of life using the SGRQ . It was not clear if the differences in sputum weight were due to higher antibiotic use in the placebo group. Therefore a further trial was conducted focussing on exacerbations. This study randomised 233 patients to 400 mg inhaled mannitol or control mannitol for 52 weeks . The population was tightly defined, requiring two exacerbations in the previous year, FEV1 between 40 and 85% predicted and a baseline SGRQ score of ≥30 points . The primary outcome was the rate of pulmonary exacerbations over 1 year. The study failed to meet its primary end-point, with a rate ratio for exacerbations of 0.92 (95% CI 0.78–1.08; p=0.3). Among secondary endpoints there was an increase in time to next exacerbation and a small improvement in SGRQ with mannitol treatment . Therefore, despite two large trials the role of mannitol in bronchiectasis treatment remains unclear. Macrolides have been widely used for bronchiectasis for many years but there was a lack of evidence until three “game-changing” studies in 2012/2013, which now provide robust evidence to support their use [57–59]. A summary of these three trials in shown in table 1. All three trials used the frequency of exacerbations as the primary outcome, but used different macrolides, different doses and had slightly difference inclusion and exclusion criteria [57–59]. The Bronchiectasis and Long Term Azithromycin Treatment (BAT) trial used azithromycin 250 mg daily, and required patients in addition to a computed tomography diagnosis of bronchiectasis to have had three exacerbations in the previous year and a positive sputum culture for bacteria . The Bronchiectasis and Low Dose Erythromycin Study (BLESS) trial used Erythromycin ethylsuccinate 400 mg twice daily and required two exacerbations in the previous year , while the Azithromycin for Prevention of Exacerbations in non-CF Bronchiectasis (EMBRACE) trial conducted in New Zealand, required only one exacerbation in the previous year and used Azithromycin 500 mg three times per week . The treatment period was 12 months in BAT and BLESS and 6 months in EMBRACE. All these trials have shown a significant reduction in exacerbation frequency compared to placebo during the treatment period as shown in table 1. Improvements were also observed in the SGRQ, with small changes in FEV1 which are unlikely to be of clinical significance. The main concern of macrolide therapy is a marked increase in macrolide resistance in oropharyngeal and other bacteria. The BAT trial showed macrolide resistance of 88% in the treatment group compared to 26% on placebo . A recent secondary analysis of the BLESS trial has suggested that erythromycin therapy was associated with the emergence, using molecular techniques, of P. aeruginosa . No patients became colonised with P. aeruginosa by culture and so the clinical importance of this finding is not clear. Azithromycin was associated with increased gastrointestinal side effects in the BAT trial, although erythromycin appeared to be better tolerated in BLESS  There have been other concerns regarding macrolides including an increased incidence of cardiovascular events although no cardiovascular complications were observed in these small RCT's . Additional concerns over macrolides include the possibility of inducing resistance in NTM, hepatotoxicity and decreased hearing . The authors recommend warning patients regarding hearing loss and to perform electrocardiogram and sputum culture for NTM prior to commencement of macrolide therapy. Macrolides should be avoided in patients with a prolonged QT interval. How macrolides achieve their beneficial effects is unclear. Alongside their antimicrobial effects, macrolides have anti-inflammatory effects including inhibition of inflammatory cell migration, cytokine secretion and possible attenuation of the production of reactive oxygen species [63, 64] Other mechanisms that have been proposed to explain macrolide benefit include reduction of biofilms surrounding virulent Gram-negative organisms such as P. aeruginosa and promotion of gastric emptying that may reduce potential for acid reflux [65, 66]. Several meta-analyses of the evidence for macrolides in bronchiectasis have recently been reported. Wu et al. , for example, demonstrated a pooled effect of macrolides that equated to a reduction of 1 exacerbation per patient per year (95% CI 0.67–1.35), an overall reduction in SGRQ compared with placebo of −5.39 (95% CI −0.88 to −9.89), small but significant improvements in dyspnoea and sputum volume and a clinically insignificant improvement in FEV1 of 20 mL. Macrolides are therefore effective, but the key question is in which patients they should now be used. BTS guidelines recommend consideration of long-term oral antibiotics for patients with ≥3 exacerbations per year or those chronically colonised with P. aeruginosa . These guidelines were written before the publication of the three recent trials and, given that the EMBRACE trial showed benefit in patients with one or more exacerbations per year, these recommendations may change. In clinical practice, macrolides are most frequently used in patients with three or more exacerbations per year, in patients with P. aeruginosa and also in patients with less frequent exacerbations who continue to have significant impairment of quality of life despite standard treatment. Further research needs to explore the best dosage and schedule for macrolide therapy with a clear aim of optimising benefits and reducing adverse events . There is a lack of evidence for alternative long-term oral antibiotics, and controlled trials are needed. Agents used frequently in clinic practice include β-lactams (amoxicillin or co-amoxiclav) and tetracyclines . The role of inhaled corticosteroids (ICS) in bronchiectasis is less clear. They have an established role in asthma and COPD, and are used in patients with bronchiectasis complicating these two disorders . Some studies have shown that regular high-dose inhaled steroids reduce 24-h sputum volume, reduce inflammatory markers in sputum and improve quality of life . However, they have not shown any significant improvement in lung function, or exacerbation frequency. In a small randomised controlled trial in bronchiectasis patients with chronic airflow limitation (but not a primary diagnosis of asthma or COPD), the combination of inhaled formoterol plus budesonide was compared with inhaled budesonide alone . The combination group experienced improved dyspnoea, coughing and health-related quality of life without alteration in sputum pathogens or an increase in adverse effects . As pointed out in a recent Cochrane review, the absence of high-quality evidence means that decisions to use or discontinue combined ICS and long-acting β-adrenoceptor agonist (LABA) in people with bronchiectasis may need to take account of the presence or absence of co-existing airway hyper-responsiveness and consideration of potential adverse events associated with combined ICS-LABA [71, 72]. These adverse effects include the recently noted increase in pneumonia risk in COPD patients . Whether this same risk applies to patients with bronchiectasis is unclear and requires further study. Holme et al. also reported in a study of 50 patients with bronchiectasis that nearly 50% of inhaled steroid users with bronchiectasis had evidence of adrenal suppression and that this correlated with poorer health status. There is no role for oral corticosteroids in bronchiectasis outwith the treatment of ABPA or for acute exacerbations of bronchiectasis that are accompanied by wheezing suggestive of concomitant asthma . Inhaled antibiotics have theoretical advantages over oral therapies by delivering higher concentrations of drug to the airway, they may reduce systemic absorption and side effects and perhaps reduce collateral damage, for example through resistance development in gastrointestinal microorganisms . Commonly used agents in clinical practice are primarily those used to target P. aeruginosa, such as tobramycin, gentamicin and colomycin. Inhaled antibiotics reduce airway bacterial load and recent data clearly demonstrate that reductions in bacterial load are associated with reduced airway inflammation, providing theoretical rationale for clinical use of inhaled antibiotics . Until recently, however, there have been little supporting data with clinically important end-points, and most have been extrapolated from the CF population in which inhaled antibiotics suppress bacterial load, reduce exacerbations and hospital admissions . Currently, however, no inhaled antibiotic agents are approved for use in bronchiectasis by any regulatory agency either in Europe or North America. Trial evidence has been mixed. Several open label studies in the late 1980's, testing nebulised β-lactams, demonstrated reduced sputum purulence, sputum volume and improvements in inflammatory markers [78–80]. In an early phase II double-blind placebo-controlled study by Barker et al. , nebulised tobramycin significantly reduced the primary outcome of P. aeruginosa bacterial load but was poorly tolerated by some patients . Increased cough (41 versus 24%; p=0.1) dyspnoea (32% versus 8%; p=0.01), chest pain (19 versus 0%; p=0.01) and wheeze (16 versus 0%; p=0.01) were reported in the tobramycin group (table 2). This phase II study has therefore never been followed by a larger phase III trial . Subsequently a single-blind randomised controlled trial of nebulised gentamicin for 12 months reported significant benefits . The study enrolled patients with chronic bacterial colonisation (three positive sputum cultures in the past 12 months), two exacerbations in the previous year and an FEV1 >30%, and excluded smokers and patients receiving other long term antibiotics. 27 patients were randomised to gentamicin 80 mg twice daily and 30 patients to 0.9% saline twice daily. After 12 months there was a significant reduction in bacterial density in the gentamicin group (2.96 (1.0–5.9) log10 CFU·mL−1 versus 7.67 (7.34–8.17) log10 CFU·mL−1; p<0.0001) . Four out of 13 patients colonised with P. aeruginosa at baseline were negative at follow-up, and 92.8% of patients colonised with other pathogens were negative by quantitative sputum culture at the end of treatment. In addition, quality of life, as measured by the SGRQ and LCQ, was improved and exacerbations were reduced (median 1.5 per year in the placebo group compared with 0 per year in the gentamicin group; p<0.0001) . Tolerance was generally better with this dose of gentamicin compared with the previous tobramycin study, although 21.9% had bronchospasm requiring bronchodilator treatment, only two patients were withdrawn for this reason. No nephrotoxicity or ototoxicity was reported . Gentamicin has been used widely in the UK following the publication of this trial. It is recommended to administer the initial dose in a controlled setting like an outpatient department to detect bronchospasm prior to starting home treatment . Until recently there is a lack of large phase III trials of inhaled antibiotics, but two such trials have been recently reported. Haworth et al. studied nebulised colistin delivered via the I-Neb (Philips Respironics, Chichester, UK) device. This trial recruited 144 patients with chronic P. aeruginosa colonisation in the UK, Russia and Ukraine . The primary outcome was the time to next exacerbation, and the study narrowly failed to meet this end-point (colistin group 165 days versus placebo 111 days; p=0.11). In the secondary end-points, a large improvement in quality of life using the SGRQ was noted (mean difference −10.5 points; p=0.006). The I-Neb device allows the monitoring of compliance and, in a pre-specified analysis based on patients that took >80% of the doses, a statistically significant difference in time to first exacerbation was seen . Aztreonam is an inhaled antibiotic licensed for treatment in cystic fibrosis. Two recent phase III trials in bronchiectasis randomised 266 (AIR-BX1) and 274 (AIR-BX2) patients to aztreonam or placebo over the course of two 28-day treatment cycles (with 28 days off treatment between cycles) . The primary outcome was the newly developed Quality of Life Bronchiectasis (QoL-B) questionnaire, the first disease specific instrument to be developed . Unfortunately, similar to the previous experience with tobramycin, intolerance was a major issue. 27 (20%) out of 134 of aztreonam-treated patients discontinued treatment in AIR-BX1 (versus 4 (3%) out of 132 treated with placebo), and 10 (7%) out of 135 stopped active treatment in AIR-BX2 (versus 5 (4%) out of 137 treated with placebo). Worsening of dyspnoea and cough were the major drivers of intolerance. The primary outcome was not reached, and secondary end-points such as exacerbations were also negative . Several reasons for the failure of this treatment to translate into bronchiectasis can be speculated. First, the dose used was optimised for CF rather than bronchiectasis and future studies should consider specific dose-ranging studies in bronchiectasis. There were imbalances in the groups in AIR-BX1 in terms of the frequency of COPD and some markers of severity which may be relevant when considering respiratory tolerance . Finally, the heterogeneity of the population in terms of aetiology, microbiology and severity may have contributed. These negative trials are, however, not the end for inhaled antibiotics in bronchiectasis. As of 2014, phase 3 trials of two formulations of inhaled ciprofloxacin have now commenced [86, 87]. A dry powder inhaled formulation has the potential to significantly reduce treatment burden. In a phase II study (n=60 patients for ciprofloxacin and n=64 patients for placebo) ciprofloxacin was associated with a significant reduction in bacterial load during a 28-day treatment period, without any significant differences in exacerbations  These trials have included patients with both P. aeruginosa and other bacteria, while most other trials have limited their indication to patients with chronic P. aeruginosa . This is the case for the dual release liposomal ciprofloxacin preparation. This agent aims to improve tolerability by liposomal encapsulation of the drug, reducing the amount of free drug in contact with the pulmonary epithelium, which may have contributed to previous intolerance of aminoglycosides. Slow release of the drug from liposomes allows for once-daily dosing which may also aid compliance . The phase II study showed excellent results with a significant reduction in P. aeruginosa CFU·mL−1 in the treatment arm (20 for ciprofloxacin versus 22 for placebo) over 24 weeks. There was also a reduction in time to next exacerbation (median 134 days versus 58 days; p=0.046 in the per protocol population) In contrast to the previous experience with aminoglycosides and aztreonam, however, both the dry powder and liposomal ciprofloxacin preparations were well tolerated [86, 87]. The current evidence for inhaled antibiotics in bronchiectasis is summarised in table 2. Therefore, the trials to date illustrate some of the issues with inhaled antibiotics in bronchiectasis. While effective in suppressing airway bacterial load, some antibiotic agents appear to have important problems with tolerability. The treatment burden associated with nebulised therapies, which include both the time to administer the dose and also to care for the machinery, are substantial and impact on compliance. McCullough et al. assessed compliance in 75 patients with bronchiectasis and found self-reported adherence of 52% for inhaled antibiotics and 39% for airway clearance . Patients treated with inhaled antibiotics should be assessed for adherence, medication-related adverse effects (e.g. throat irritation or pain, abnormal taste sensation, cough, chest discomfort) and development of resistant organisms. Although there is no evidence to support eradication per se, all of the prognostic studies to date have clearly identified P. aeruginosa persistence as an independent mortality predictor in addition to being associated with more extensive lung disease and worse pulmonary function [7, 9, 89]. In keeping with recommendations in cystic fibrosis, most specialist bronchiectasis centres will attempt eradication of P. aeruginosa upon first isolation . Retrospective studies reporting high rates of P. aeruginosa eradication with treatment must be interpreted in light of data that suggests spontaneous clearance of P. aeruginosa occurs frequently in bronchiectasis both in clinical practice and in the placebo arms of randomized controlled trials [90, 91]. Therefore the authors will typically perform a second sputum sample pre-treatment before commencing eradication  The BTS guidelines provides a useful algorithm for P. aeruginosa eradication . The appropriate length of treatment for exacerbations is not known, but consensus guidelines recommend 14 days of treatment with antibiotic therapy guided by previous sputum microbiology . The only real published data are from an inpatient intravenous antibiotic study in which Murray et al. demonstrated significant reductions in 24-h sputum volume and C-reactive protein, with improvements in quality of life, exercise capacity and clearance of bacteria after 14 days of treatment . Such data are not available to suggest if shorter durations are equally effective . There is a great need for prospective data on the management of bronchiectasis exacerbations. Surgery is now rarely employed in bronchiectasis, although in highly localised bronchiectasis with symptoms that cannot be controlled by maximal medical therapy, referral for lobectomy or segmentectomy may be considered. There are limited long-term outcome data for bronchiectasis patients after surgery and one of the largest series described an operative complication rate of 8.9% for thoracoscopic lobectomy or segmentectomy for bronchiectasis [93, 94]. Patients with bronchiectasis are frequently elderly, and it is important to manage associated cardiovascular disease and other co-morbidities. Anxiety and depression are very common in bronchiectasis with a reported prevalence of anxiety of 18–55% and of depression of 13–34% [95–97]. These disorders also need to be recognised and managed. Bronchiectasis is a heterogeneous disease with a highly variable impact on patients. Severity ranges from patients without daily symptoms who have infrequent exacerbations, to patients requiring lung transplantation. Rate of lung function decline is highly variable and is associated with P. aeruginosa colonisation and severe exacerbations [98, 99]). Treatments can place a large burden on patients in terms of time, and can have serious side effects for both the patient, and for the community in terms of antibiotic resistance . Therefore, patients require treatment appropriate to their stage and severity of disease. Recently, the European bronchiectasis network described the first clinical prediction tool for hospital admissions and mortality in bronchiectasis . This study, conducted in the UK, Italy and Belgium, derived a scoring system, the bronchiectasis severity index (BSI), which can accurately identify patients at the highest risk of complications, including exacerbations and impaired quality of life. The authors have created an online calculation tool accessible at www.bronchiectasisseverity.com and the scoring system is shown in table 3. This is the only prediction tool or severity classification system for bronchiectasis that has so far undergone external validation. The predictors described in table 3 were independently identified by a large Spanish study  which adds to the external validity of both studies. The stepwise management of non-CF bronchiectasis. Alternative oral antibiotics such as β-lactams or tetracyclines may be appropriate for patients intolerant or not suitable for macrolides. Severity of disease and risk of complications provides a useful framework for clinical decision making around which patients require long-term treatments such as macrolides, airway adjuncts, inhaled antibiotics and other measures. The authors would advocate a stepwise approach to management of bronchiectasis similar to that used in asthma and COPD [101, 102]. Patients with bronchiectasis should be commenced on therapy at a stage appropriate to their severity of disease which should be based on clinical judgement and may be augmented by assessment of clinical severity parameters such as the BSI, exacerbation frequency or the presence of P. aeruginosa. Patients who continue to have persistent symptoms or exacerbations despite treatment at stage 1 should have their therapy escalated and so on. This represents a pragmatic approach to treatment decisions that reflects how the majority of physicians practice. A model flow chart based on the authors own practice is presented in figure 2. New therapies in development for bronchiectasis and their possible role. CFTR: cystic fibrosis transmembrane conductance regular. The above highlights the difficulties of treating bronchiectasis, with a limited number of options, current therapies that are labour intensive and are associated with adverse effects. In addition, neutrophilic inflammation, which is central to the pathogenesis of bronchiectasis, has been largely resistant to existing treatments . An absence of large randomised trials has meant that there are no licensed therapies for bronchiectasis in Europe or FDA-approved therapies in the USA. Much of the development of novel agents centres around targeting neutrophilic inflammation. Given the previously noted importance of neutrophil elastase in pathogenesis , this represents a promising therapeutic target. Phase II studies of oral neutrophil elastase inhibitors have been reported while others are ongoing . Data show the ability to inhibit elastase activity but without clear clinical benefits yet. CXCR2 is expressed on a number of leukocytes but most prominently on neutrophils [106, 107]. It is a key neutrophil trafficking receptor during inflammation. It also has diverse effects on inflammation as CXCR2 blockage inhibits mucus secretion both by inhibiting neutrophil recruitment and through direct inhibition of goblet cells [106, 107]. CXCR2 antagonism is likely to reduce rather than prevent neutrophil recruitment to the airway as other chemoattractants, particularly leukotriene B4 have been shown to be elevated in bronchiectasis and to drive neutrophil recruitment . Phase II studies of CXCR2 antagonists in bronchiectasis have been reported in abstract form, with one (AZD5069) reducing sputum neutrophil counts by 69% versus placebo (26 patients in each group) . Interestingly, the study reported higher airway inflammation despite reduced neutrophils and an increase in discontinuation due to infections . One concern regarding anti-inflammatory drugs has been the potential that reducing neutrophil numbers could lead to uncontrolled bacterial infection, as occurred in a previous trial of a leukotriene B4 receptor antagonist in cystic fibrosis [109, 110]. Statins have immunomodulatory effects and may have a role in neutrophilic inflammation. Atorvastatin was recently the subject of small RCT in patients with moderate bronchiectasis . This study found improved cough in statin users, but statin use was also associated with an increase in adverse events . A second trial in patients with P. aeruginosa will shortly be reported. Novel antimicrobials are needed in the face of rising antibiotic resistance. A new anti-pseudomonal compound based on the antimicrobial peptide protegrin is currently in proof of concept trials for patients with exacerbations  and several new specific anti-pseudomonal antimicrobials are currently in development . Multiple new therapies are in development for cystic fibrosis that specifically target Cystic fibrosis transmembrane conductance regulator (CFTR) function  Whether these will find a role in non-CF bronchiectasis is unclear where the role of CFTR mutations are controversial. New therapies under development are shown in figure 3. Cystic fibrosis research has benefitted greatly from the creation of national and international networks such as the European Cystic Fibrosis Society (ECFS), the ECFS clinical trials network and the ECFS patient registry . The developing landscape in bronchiectasis necessitates collaborative working to facilitate multinational clinical trials, improve quality of care for bronchiectasis patients and support translational science. Towards these goals a number of countries are now establishing national registries for bronchiectasis, including in the USA through the US COPD Foundation , and in Europe through the European Respiratory Society, the EMBARC network (www.bronchiectasis.eu), is working to bring together clinical researchers in Europe by creating a European bronchiectasis registry. The future for bronchiectasis patients is bright, if momentum can be sustained to produce the treatments and the evidence we need to provide high quality care. The goals of treatment in bronchiectasis are to facilitate airway clearance, suppress bacterial infection and prevent exacerbations. Advances in mucolytic, antibiotic and anti-inflammatory therapies are urgently needed. A stratified approach to treatment is recommended. Current treatment practices are likely to be significantly impacted by ongoing large scale clinical trials. Diagnosis and treatment of bronchiectasis. Spanish Society of Pneumology and Thoracic Surgery. Arch Broncopneumol 2008; 44: 629–640.
. Mucosal inflammation in idiopathic bronchiectasis: cellular and molecular mechanisms. Eur Respir J 2008; 31: 396–406. Sputum elastase in steady-state bronchiectasis. Chest 2000; 117: 420–426. The chemotactic activity of sputum from patients with bronchiectasis. Am J Respir Crit Care Med 1998; 157: 723–728.
. Inflammation: a two-edged sword-the model of bronchiectasis. Eur J Respir Dis Suppl 1986; 147: 6–15. Assessing immune function in adult bronchiectasis. Clin Exp Immunol 2006; 144: 440–446. Effect of granulocyte-macrophage colony-stimulating factor on neutrophil function in idiopathic bronchiectasis. Respirology 2013; 18: 1230–1235. Neutrophil elastase increases MUC5AC mRNA and protein expression in respiratory epithelial cells. Am J Physiol 1999; 276: L835–L843. Effects of human neutrophil elastase and Pseudomonas aeruginosa proteinases on human respiratory epithelium. Am J Respir Cell Mol Biol 1991; 4: 26–32.
. Neutrophil elastase cleaves C3bi on opsonized pseudomonas as well as CR1 on neutrophils to create a functionally important opsonin receptor mismatch. J Clin Invest 1990; 86: 300–308. Complement receptor expression on neutrophils at an inflammatory site, the pseudomonas infection lung in cystic fibrosis. J Clin Invest 1989; 84: 1302–1313. Human neutrophil peptides and phagocytic deficiency in bronchiectatic lungs. Am J Respir Crit Care Med 2009; 180: 159–166.
. Elastase-mediated phosphatidylserine receptor cleavage impairs apoptotic cell clearance in cystic fibrosis and bronchiectasis. J Clin Invest 2002; 109: 661–670. The Th17 pathway in cystic fibrosis lung disease. Am J Respir Crit Care Med 2011; 184: 252–258.
. The airway microbiome and disease. Chest 2013; 144: 632–637.
. Predominant pathogen comptetition and core microbiota divergence in chronic airway infection. ISME J 2014; 9: 217–225. Clinical measures of disease in adult non-CF bronchiectasis correlate with airway microbiota composition. Thorax 2013; 68: 731–737. Increased severity of respiratory infections associated with elevated anti-LPS IgG2 wich inhibits serum bactericidal killing. J Exp Med 2014; 211: 1893–1904.
. Impact of mannose-binding lectin insufficiency on the course of cystic fibrosis: a review and meta-analysis. Glycobiology 2011; 21: 271–282. Common variable immunodeficiency and the complement system; low mannose binding lectin levels are associated with bronchiectasis. Clin Exp Immunol 2005; 142: 576–584. Mannose binding lectin 2 gene polymorphisms and lung damage in primary ciliary dyskinesia. Pediatr Pulmonol 2015; 50: 179–186. Donat Sanz Y, et al. 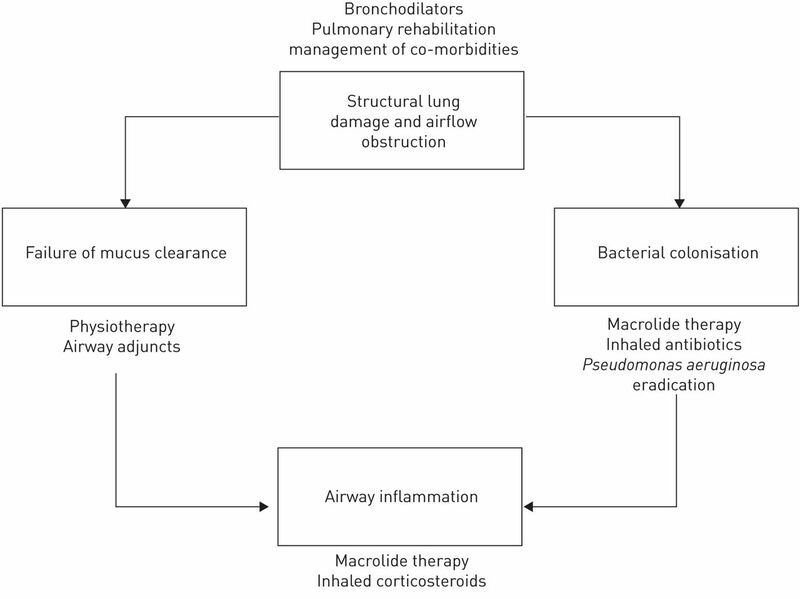 Factors associated with bronchiectasis in patients with COPD. Chest 2011; 140: 1130–1137.
. Symptoms of airway reflux predict exacerbations and quality of life in bronchiectasis. Respir Med 2013; 107: 1008–1013.
. Chest physiotherapy techniques in bronchiectasis. Clin Chest Med 2012; 33: 351–361. Guidelines for the physiotherapy management of the adult medical spontaneously breathing patient. Thorax 2009; 64: Suppl. 1, i1–i51.
. A randomised crossover trial of chest physiotherapy in non-cystic fibrosis bronchiectasis. Eur Respir J 2009; 34: 1086–1092. Phase 3 randomized study of the efficacy and safety of inhaled dry powder mannitol for the symptomatic treatment of non-cystic fibrosis bronchiectasis. Chest 2013; 144: 215–225. The effect of long-term macrolide treatment on respiratory microbiota composition in non-cystic fibrosis bronchiectasis: an analysis from the randomised double blind placebo controlled BLESS trial. Lancet Respir Med 2014; 2: 988–996. Van der Werf TS, et al. Immunomodulatory effects of macrolide antibiotics. Respiration 2011; 81: 75–87. Azithromycin impact on neutrophil oxidative metabolism depends on exposure time. Inflammation 1998; 22: 191–201.
. Macrolides and bronchiectasis: clinical benefit with a resistance price. JAMA 2013; 309: 1295–1296.
. Azithromyci for prevention of exacerbations of COPD. N Engl J Med 2011; 365: 2234–2235.
. Long-term macrolides for non-cystic fibrosis bronchiectasis: a systematic review and meta-analysis. Respirology 2014; 19: 321–329. Inhaled corticosteroids for stable chronic obstructive pulmonary disease. Cochrane Database Syst Rev 2012; 7: CD002991. Inhaled steroids improve quality of life in patients with steady-state bronchiectasis. Respir Med 2006; 100: 1623–1632. Clinical efficacy and safety of budesonide-formoterol in non-cystic fibrosis bronchiectasis. Chest 2012; 141: 461–468.
. Combined inhaled corticosteroids and long acting beta2-agonists for children and adults with bronchiectasis. Cochrane Database Syst Rev 2014; 6: CD010327.
. Inhaled steroids for bronchiectasis. Cochrane Database Syst Rev 2009; CD000996. Impact of inhaled corticosteroid use on outcome in COPD patients admitted with pneumonia. Eur Respir J 2011; 38: 36–41. Adrenal suppression in bronchiectasis and the impact of inhaled corticosteroids. Eur Respir J 2008; 32: 1047–1052.
. Inhaled antibiotics for lower airway infections. Ann Am Thorac Soc 2014; 11: 425–434. A network meta-analysis of the efficacy of inhaled antibiotics for chronic Pseudomonas infections in cystic fibrosis. J Cyst Fibros 2012; 11: 419–426.
. Nebulized amoxicillin in chronic purulent bronchiectasis. Clin Ther 1985; 7: 593–599. The response of patients with purulent bronchiectasis to antibiotics for four months. Q J Med 1988; 66: 163–173. Short term response of patients with bronchiectasis to treatment with amoxycillin given in standard or high doses orally or by inhalation. Thorax 1986; 41: 559–565. A randomised controlled trial of nebulised gentamicin in non-cystic fibrosis bronchiectasis. Am J Respir Crit Care Med 2011; 183: 491–499. Quality of life questionnaire-Bronchiectasis: final psychometric analyses and determination of minimal important difference scores. Thorax 2014; 70: 12–20. Ciprofloxacin dry powder for inhalation in non-cystic fibrosiss bronchiectasis: a phase II randomised study. Eur Respir J 2013; 41: 1108–1115. Inhaled, dual release liposomal ciprofloxacin in non-cystic fibrosis bronchiectasis (ORBIT-2): a randomised, double-blind, placebo-controlled trial. Thorax 2013; 68: 812–817. ‘All illness is personal to that individual’: a qualitative study of patients’ perspective on treatment adherence in bronchiectasis. Health Expect 2014; [In press DOI: 10.1111/hex.12217]. Vendrell Relat M et al. Multidomensional approach to non-cystic fibrosis bronchiectasis; the FACED score. Eur Respir J 2014; 43: 1357–1367. Non cystic fibrosis bronchiectasis: a longitudinal retrospective observational cohort study of Pseudomonas persistence and resistance. Respir Med 2014; [In press DOI: 10.1016/j.rmed.2014.07.021].
. Assessing response to treatment of exacerbations of bronchiectasis in adults. Eur Respir J 2009; 33: 312–318. Videoassisted thoracic surgery for bronchiectasis. Ann Thorac Surg 2011; 91: 239–243. de Albuquerque AL et al. Lung resection improves the quality of life of patients with symptomatic bronchiectasis. Ann Thorac Surg 2014; 3: 1034–1041. Anxiety-depressive disorders and bronchiectasis. Rev Mal Respir 2014; 31: 230–236. Presence of anxiety and depression in patients with bronchiectasis unrelated to cystic fibrosis. Arch Bronconeumol 2013; 49: 415–420. Relationship between psychological well-being and lung health status in patients with bronchiectasis. Respir Med 2002; 96: 686–692.
. Defining severity in non-cystic fibrosis bronchiectasis. Expert Rev Respir Med 2014; 8: 249–262. Factors associated with lung function decline in adult patients with stable non-cystic fibrosis bronchiectasis. Chest 2007; 132: 1565–1572.
. Risk of population antimicrobial resistance associated with chronic macrolide use for inflammatory airway diseases. Lancet Respir Med 2013; 1: 262–274. Summary of the 2008 BTS/SIGN British Guideline on the management of asthma. Prim Care Respir J 2009; 18: Suppl. 1, S1–S16.
. Sputum sol neutrophil elastase activity in bronchiectasis: differential modulation by syndecan-1. Am J Respir Crit Care Med 2003; 168: 192–198. Phase II study of a neutrophil elastase inhibitor (AZD9668) in patients with bronchiectasis. Respir Med 2013; 107: 524–533. A chemokine receptor CXCR2 macromolecular complex regulates neutrophil functions in inflammatory diseases. J Biol Chem 2012; 287: 5744–5755. CXCR2 antagonists for the treatment of pulmonary disease. Pharmacol Ther 2009; 121: 55–68. Efficacy and safety of AZD5069, a CXCR2 antagonist in adult bronchiectasis. Eur Respir J 2013; 42: Suppl. 57, P1593. BIL 284 reduces neutrophil numbers but increases P. aeruginosa bacteremia and inflammation in mouse lungs. J Cyst Fibros 2014; 13: 156–163. A randomized double blind, placebo controlled phase 2 trial of BIIL284BS (an LTB4 receptor antagonist) for the treatment of lung disease in children and adults with cystic fibrosis. J Cyst Fibros 2014; 13: 148–155. Peptidomimetic antibiotics target outer-membrane biogenesis in Pseudomonas aeruginosa. Science 2010; 327: 1010–1013. Anti-PcrV antibody in cystic fibrosis: a novel approach targeting Pseudomonas aeruginosa airway infection. Pediatr Pulmonol 2014; 49: 650–658. Comparative demographics of the European cystic fibrosis population: a cross-sectional database analysis. Lancet 2010; 375: 1007–1013. The Bronchiectasis Research Registry: a Collaborative Research Cohort for Non-Cystic Fibrosis Bronchiectasis. Am J Respir Crit Care Med 2012; A3654.